Cacao - or cocoa - is a South American native species recognized worldwide by its beans, which are processed and consumed in a wide number of commercial products. Cacao is, undoubtedly, one of the world's favorite foods. It is widely understood that the rich antioxidant content of raw cacao beans changes and gets reduced depending on the amount of processing. However, a study has analyzed and determined the exact level of degradation that the beans of Theobroma cacao suffer during industrial processing and how it affects their active compounds, as well as their unique nutritional and medicinal potential. Procyanidin C1 is the main flavanol found in cocoa. This powerful antioxidant compound can also be found, at different levels, in cinnamon, tea plant, apple, litchi, grape, and peach as well as in blueberries and red berries. Procyanidin C1 has been shown to play an important role in relaxing blood vessels, increasing nitric oxide production, and supporting vascular health. The study, which was conducted in the Université catholique de Louvain (Belgium) and published in the journal Foods (February 2017), analyzed the industrial processing of cacao beans and assessed how procyanidin C1 degradation might affect to the antioxidant activity of a chocolate. An aqueous model medium, heated at 90°C, was used to test the degradation of cacao's procyanidin compounds, and then, the relative antioxidant capacity of each new compound was analyzed. 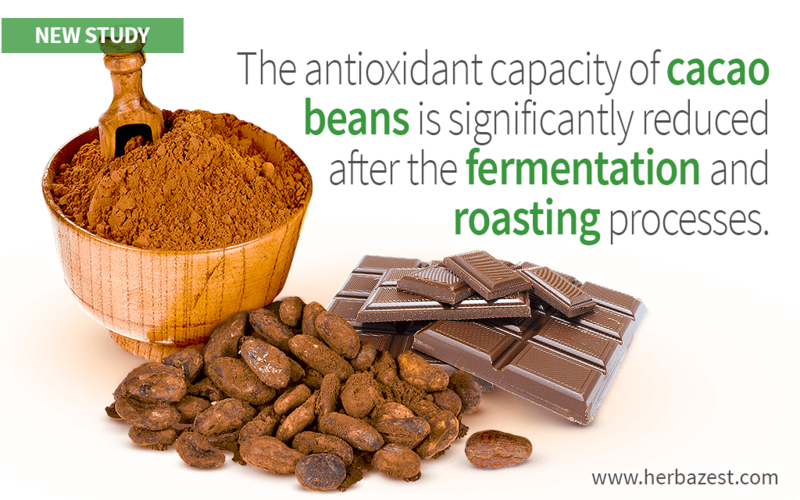 Afterwards, the results were compared to the unprocessed compounds of raw cacao beans in order to determine their fate during fermentation and roasting. First, an enzymatic reaction (epimerization) was observed during the degradation of procyanidin C1, and then, it was registered a reduction in molecular weight as well as a change in the physical properties of the compounds in procyanidin C1 - a process called depolymerization - with the oxidation capacity being affected to a lesser extent. When compared to raw cacao beans, the concentration of procyanidin C1 compounds was shortened in about a half during the fermentation process, and it was further reduced to roughly 10% during the roasting process. While antioxidant effects due to the presence of procyanidin C1 compounds can still be detected in cacao products, the study showed that raw cacao beans possess a higher amount of beneficial compounds, many of which are significantly transformed or reduced in potency during the fermentation and roasting processes. So, in case you are wondering, the answer is yes. Your favorite chocolate bar comes with a small dose of antioxidants, but in order to fully reap the health benefits of cacao beans, you might consider trying less processed forms, such as dark chocolate and cacao nibs.